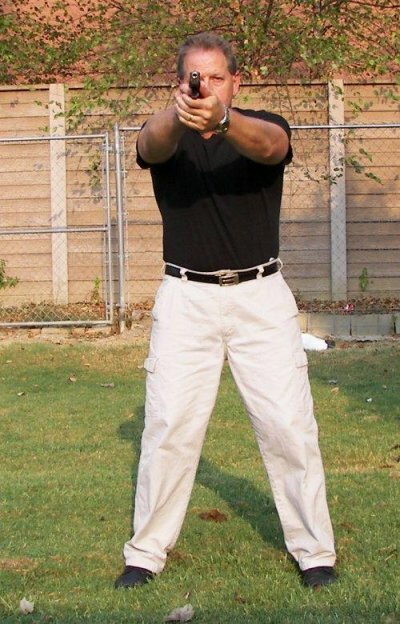 The handgun shooting stance is another factor that is debated endlessly among experienced shooters. The stances are labeled, but not here. I’m just going to show you two ways to stand when shooting at stationary targets. You can decide which one works best for you and make modifications as needed. Remember, almost nothing in all of this is cut in stone and cannot be micro-adjusted. You will inevitably make some adjustments based on your body type, height, weight, strength, physical condition, etc. And keep in mind that in a real life self defense encounter, you will not likely have time to think about all these factors, take your stance and prepare to shoot. This is just where you learn to shoot the gun effectively and hit a target. 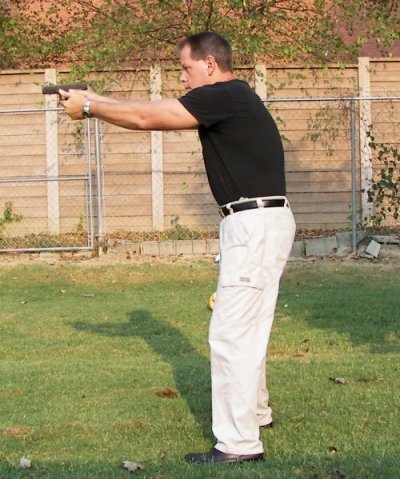 This first handgun shooting stance is the strongest with the strong leg to the side and rear of the weak leg. This is not to be confused with turning from the side toward the target. You will actually face the target, turn slightly toward your strong side, and put your strong leg out to the side and to the rear. This provides a strong, balanced stance when shooting. It also allows lateral and diagonal movement if necessary, and does not present a full size profile from the target to the shooter (important if somebody is shooting back). The strong arm is straight and stiff with the support arm and your chosen grip in place. The gun is brought up in a straight line into your line of vision until the sights are lined up and on the target. 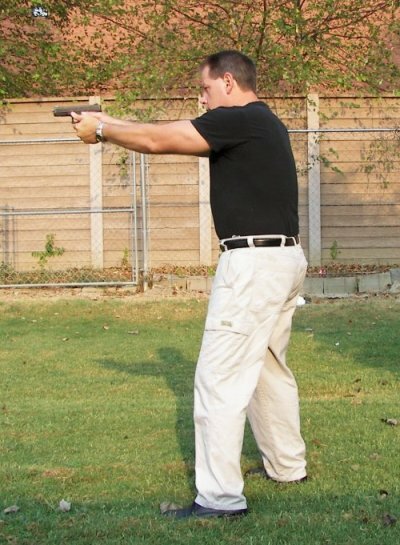 The second shooting stance is one used by competitive shooters. 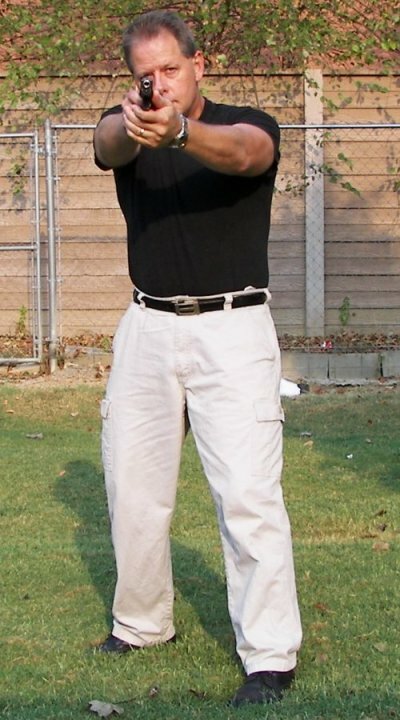 It is a squared-off stance with feet slightly wider than shoulder width, knees slightly bent, with the shooter’s body squarely facing the target. The gun is brought straight up into the line of sight until the sights are lined up and on the target. Target acquisition is rapid with this stance, though it is not as strong a stance as the first. So both have their advantages according to what kind of shooting you are doing, and what you are shooting. In my experience, women who are new handgun owners and shooters have a tendency to lean away from the handgun and consequently from the target when learning to shoot. I have no idea why that is, but in watching time after time, this is their tendency until they consciously correct it. Leaning away from the gun is never the correct way to shoot from a solid stance. To correct this, consciously lean slightly forward when shooting and be aware of your upper body position until it is automatic. These handgun shooting stance pointers will get you started with a platform that you can adjust as needed for your shooting.